The Mayor’s Education Summit Advisory Group was developed to formulate recommendations in response to feedback from over 1,300 people from 20 community conversations, nearly 200 online survey responses and 500 attendees of the day-long Education Summit held in April. The Advisory Group recommendations include a variety of programs for students of all ages, from early learning through high school and beyond. The group concentrated its work in four areas: improving access to high quality learning opportunities and programs, creating positive, supportive and high quality teaching and learning opportunities, providing authentic family and community support and engagement and strengthening post-secondary access and attainment. They have identified criteria for prioritizing the recommendations, including those most important in having an impact on the opportunity gap as it relates to African American/Black students and other students of color, those that can be implemented in the short-term and those the City can have the greatest impact on. Expanding the innovation school model, which has been successful addressing disparities in middle school around attendance, behavior and curricula, to a high school. Mayor Murray and the Seattle Department of Education and Early Learning, in partnership with the Seattle School District, community, philanthropy, and the business community, will release an action plan in January 2017 outlining the next steps for implementation. Leaders from Seattle, Erica Johnson (Senior Policy Advisor, Early Learning Division) and Leilani Dela Cruz (Operations Manager, Early Learning Division) today will join policymakers from 12 municipal governments across the country in the first-ever convening to establish a network of cities dedicated to providing high-quality pre-kindergarten education to students, nationwide. Held in New York City, the forum will allow for diverse municipalities to take part in an ongoing national dialogue about increasing access to high-quality education for all children regardless of their race, socio-economic status or zip code. Studies have shown that pre-kindergarten leads to better long-term academic and behavioral outcomes for children. Moreover, evaluations of existing universal pre-K programs reveal a significant financial benefit to low and middle class families who struggle with childcare costs. During the October 6th Learning Lab, policy makers from participating cities will take part in roundtable discussions examining achievements, challenges, and lessons learned from NYC’s Pre-K for All expansion, sharing ideas and insights gained from their own city’s pre-K experiences. The Learning Lab is an opportunity for pre-K leaders to build relationships and identify thought partners for ongoing collaboration on how to implement high-quality pre-K that best meets the needs of children and families in their own municipalities, learning from other cities’ experiences. Finally, the host City and visiting policymakers will be encouraged to work together to advocate in support of expanding access and funding to early childhood education. Seattle Preschool Program launched in Fall 2015, and is in it’s second year. The program currently has over 30 classrooms city-wide, and is providing full-day, affordable, high-quality preschool to over 600 students. Seattle Preschool Program anchors it’s quality improvements in supporting the growth of teachers through professional development, in-class coaching, tuition support to complete an early learning degree, and increased pay for teachers. In New York City, 70 percent of four and five year olds are enrolled in a Universal Pre-k Program. As of the first day of the 2016-17 school year, over 70,400 children were registered for free, full-day, high quality pre-K, up from 19,287 prior to the start of Pre-K for All. This extra year of learning is a critical part of this administration’s commitment to equity and excellence for all students, and a way to address disparities in educational opportunity for our city’s youngest learners. We hope you consider applying for this opportunity to create high-quality summer learning experiences for your students! Mayor Ed Murray delivered his 2017-18 Proposed Budget to the City Council yesterday, and I am pleased to inform you of a few exciting new items included in the Department of Education and Early Learning’s proposed budget. When Mayor Murray appointed me as director of DEEL, he made it clear that our mission would be to advance equity in education and help close the achievement gap that has long plagued our schools. This budget invests in our kids’ education and continues making progress toward ensuring everyone has access to opportunity. First, the 2017 Proposed Budget includes $1 million to implement the first phase of the Mayor’s Education Summit Advisory Group’s recommendations, which will be announced soon. One of these recommendations is to fund an additional 200 high quality summer learning slots for middle and high school students, primarily focusing on African-American and other students of color. Another recommendation will provide funds for a pilot innovation model at one high school modeled on the Families and Education Levy middle school innovation program. This program significantly improves academic achievement by following a holistic approach that addresses academic skills, social emotional development, health, and family engagement. And, the Mayor’s budget includes funding in the Seattle Parks and Recreation Department to expand the My Brother’s Keeper initiative that helps mentor African-American boys at Aki Kurose Middle School to five other middle schools. Second, the proposed budget adds funding of $500,000 in 2017 to expand the Parent-Child Home Program to increase the number of young children who benefit from literacy education. Third, the Seattle Preschool Program (SPP) Levy in DEEL’s 2017 Proposed Budget includes the planned addition of new SPP classrooms, from 32 in the 2016-17 school year to 53-60 classrooms in 2017-18. This increase means up to 1,200 more students will be served by the program in the next two years. Finally, the Families and Education Levy (FEL) in DEEL’s 2017 Proposed Budget includes additional early learning preschool slots, funding for four new elementary schools, and increased summer learning funding for elementary and middle schools. Additionally, Mayor Murray announced the creation of a Youth Opportunity Sub Cabinet that will be comprised of City department directors whose funding and programs focus on youth in Seattle. This group will serve as a structure to better align the City’s work with youth around common goals and outcomes. I’m excited about the additional kids we’ll be able to serve with evidence-based and innovative strategies to help them succeed in school and in life. The budget shows Mayor Murray’s commitment to this goal. I would like to personally thank you for your continued support of and involvement with our programs and services, and to Mayor Murray for including these proposals as part of his 2017-18 Proposed Budget. Wishing for more Seattle Preschool Program classrooms in North Seattle? We’re on our way! 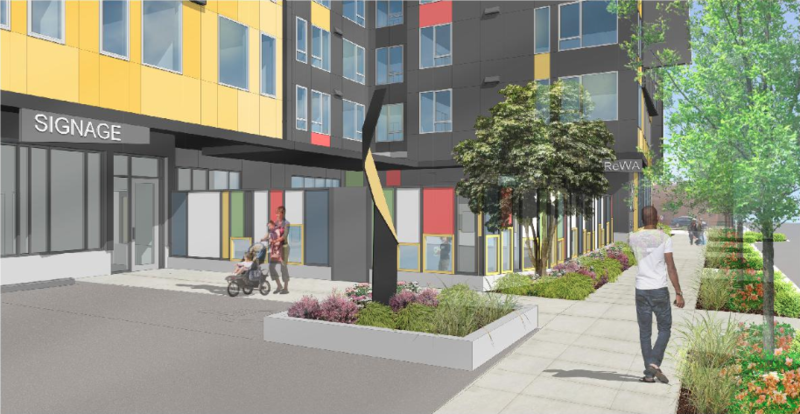 The Northeast Design Review Board will hold the first recommendation meeting tonight for a 6-story 70-apartment building the Low Income Housing Institute (LIHI) plans to build in Lake City. The project will include a preschool, daycare center, and nine parking stalls. 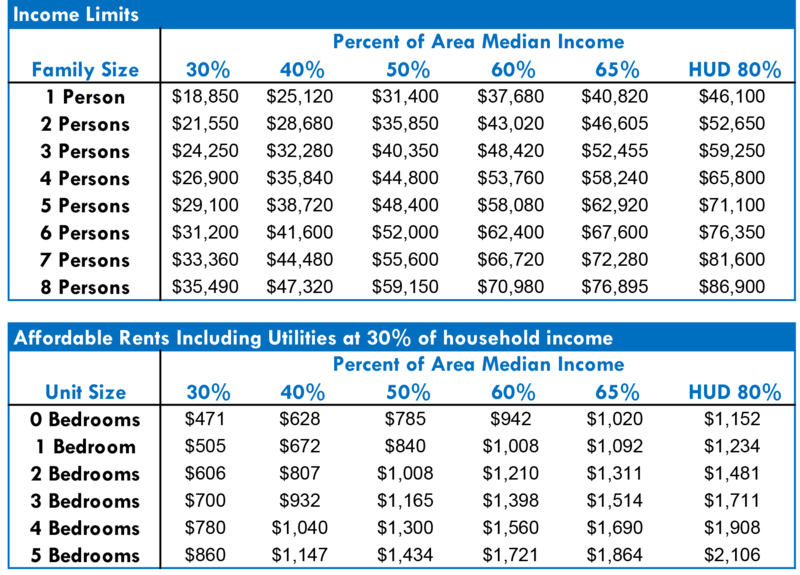 Apartments would serve tenants at a range of income levels from 0 to 60 percent of area median income, which roughly means two-bedroom units would rent for no higher than $1200 and three-bedrooms no higher than $1400. Lake City is somewhat unique in the degree of community involvement in urban design thanks to a three-year envisioning project that established a framework and led the neighborhood to ask for a civic core rezone with stronger pedestrian and urban design standards. 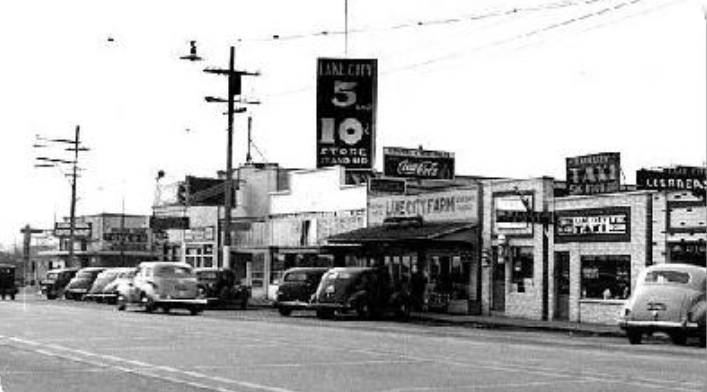 Historically, Lake City was defined by its auto-oriented character. 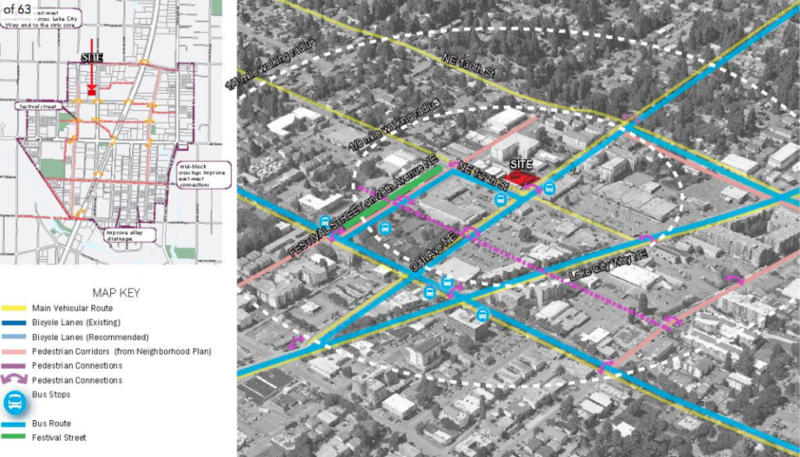 The design proposal layouts how Lake City Way was a thoroughfare for the region early in the automobile era and a commercial focal point that apparently eclipsed the trolley corridor. Lake City was a township of more than 40,000 when it incorporated in 1949—that was good enough for fourth largest community in the state. However, in an all too common story in auto-oriented retail, a bigger draw came in the Northgate Mall in 1950 and I-5 further altered transportation and commerce patterns when it opened in 1967, both of which pulled customers and commercial vitality from Lake City. The envisioning project seeks to flip the script and make a more vital Lake City with a human-scaled walkable environment. The LIHI building aims to do its own part to achieve that goal with more inviting sidewalks, better pedestrian crossings, and lush landscaping. Architects selected Urban Pinnacle Oaks to anchor the landscaping, which is also filled in with a variety of plants, such as Munchkin Oakleaf Hydrangea, Creeping Lily Turf, Coastal Strawberry, Fragrant Sweetbox, and Pink Fountain Grass. The site’s sparing use of parking reflects the solid transit in the area. The 65 bus, which runs to University of Washington, stops just outside the site; the 41, which runs express via I-5 to downtown, stops a double-block to the south on 125th St, and the 372 and the 522 stop at Lake City Way and 125th St, a four-minute walk. Minimal parking also makes providing affordable housing easier by avoiding the high cost of building parking. The childcare facility includes an outdoor play area surrounded by a colorful fence. 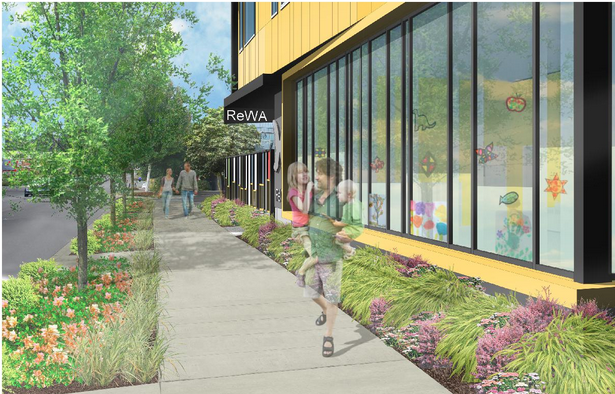 The architects aim to improve the “eyes on the street” effect with administrative offices and preschool classroom’s windows pointing out to the street. Both kids and adults can seek further on-site recreation opportunities on the rooftop deck, which includes another play area, lounge and picnic seating, a p-patch garden, a fire pit, and trees. The roof also includes three separate photo-voltaic solar arrays that will provide renewable energy on-site. 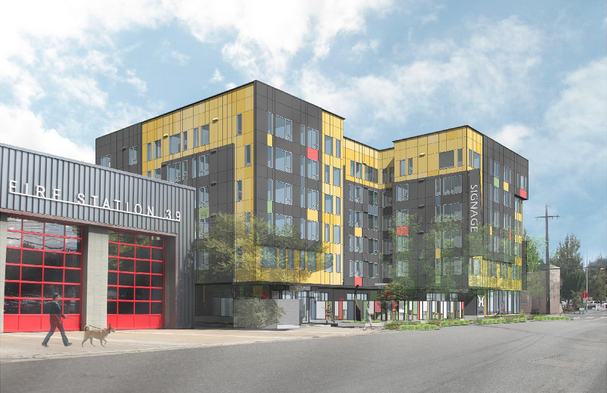 This LIHI project in Lake City is the type of project that should be going up in every neighborhood in the city as we cope with an affordability crisis and try to house an estimated 3,000 homeless people. If your neighborhood’s zoning doesn’t allow a multi-family project like this, you might ask yourself why not. The building is designed with careful deference to the neighborhood’s wishes as expressed by its envisioning project and neighborhood plan. Landscaping beautifies the streetscape; better sidewalks improve the block’s walkabiity, all while providing valuable community services via the daycare, preschool, and rent restricted apartments. What an asset! Give us more projects like this. The project has had one other design review, an Early Design Guidance (EDG) meeting in June, and could gain recommendation from the Northwest Design Review Board if things go well tonight. To comment attend the 6.30pm meeting at Room 202 of the Good Shepherd Center or email the assigned planner, Joshua Johnson (joshua.johnson@seattle.gov).